Seeking Victory: How Much is That Doggie in the Window? If this puppy is really lucky he will be purchased by someone who will love him and care for him and take him to training and make him part of their life. If he is sort of lucky the person who buys him on impulse because "he was just sooooo cute, I fell in love with him instantly" will have a nice safe backyard to put him for the rest of his life and give him a pat when it is dinnertime. This is after they lose their patience with toilet training after 2 weeks because he was sold at 6 1/2 weeks of age and doesn't have the ability to control his bladder yet. If he is unlucky the impulse buyer will not have a safe yard and after a couple of weeks of exploring the perimeter he will find a gap, squeeze out and get run over by a car or maybe he will be picked up by the pound and then voluntarily surrendered by his owner because "He is just too much trouble". Hopefully then an amazing rescue organisation or a wonderful owner will find him and give him a second chance. Yay! Potential happy ending for the pet shop puppy. Now lets talk about his mum and dad. You see, pet shop puppy came from where most pet shop puppies come from, a puppy mill. Pet shop puppy's mum is 5 years old and has had 10 litters of pups. She has mammary tumours from being bred excessively and most of her teeth are rotten because she has never seen a vet. She is lucky because she has given birth easily each time and not had complications or else she would almost certainly have died. Quite a few of her puppies have died on the cold concrete floor where they were born. Sometimes the dead pups were left there for a week before they were taken away. She is so hungry, some days no food comes but she keeps feeding those puppies so her bones are weak and brittle. She is scared, she knows (because she is a very smart girl) that under Australian law it is currently legal to kill her with a hammer blow to her head when she is no longer suitable to breed (as long as it is done humanely...). Pet shop puppy's dad is in a similar situation (although we aren't sure who he is because 5 dogs had access to the mother when she was on heat). His fur is matted with faeces and he has lost the hearing in one of his ears due to a recurrent untreated infection. 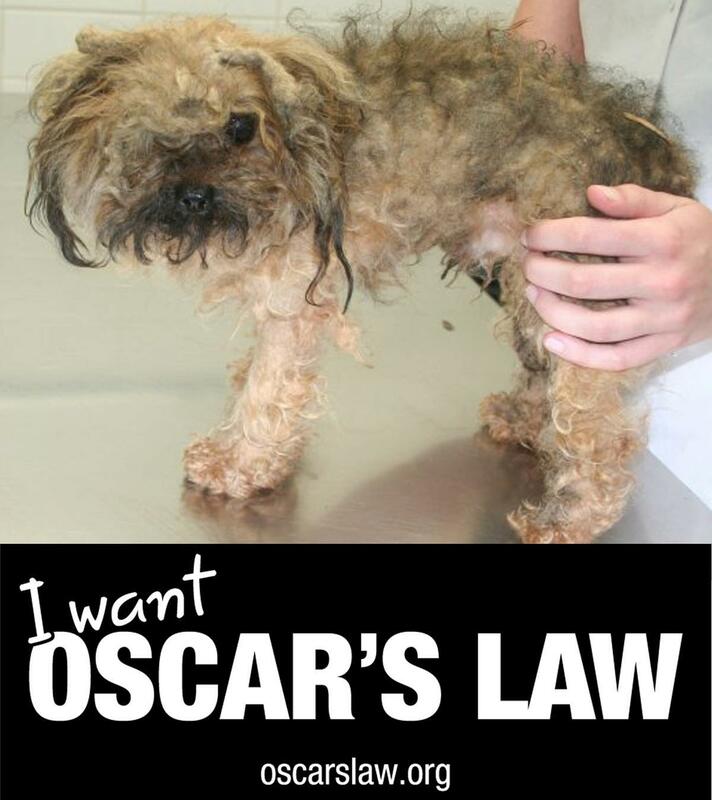 Don't despair though because Oscar's law has heard about this puppy farm and is in the process of providing information to the RSPCA which will result in a raid that will rescue Pet shop puppy's mum and dad. They will receive medical treatment and loving homes will be found for them. Now clearly this whole scenario is hypothetical but it is based on fact. I really do urge you to spend some time looking at the Oscar's law website and if you feel it is appropriate, do some of the things they suggest you can do to help. The day I discovered Oscar's Law, a few weeks after adopting Ted (not a puppy farm pup- he was just abandoned), my brother and sister-in-law bought a pup from a pet shop. I had just posted all this stuff about not buying animals from pet shops and the horror of puppy mills all over my Facebook page when they posted a photo of their dear little girl. They didn't know. They probably, like most people who buy animals from pet shops, thought they were doing a good thing by 'rescuing' her from the pet shop- which is kinda true. That little pup fell on her feet bigtime, she is loved and cared for and trained and there is not a pink accessory in existence that she does not own. But at the end of the day, buying an animal from a pet shop is just supporting the horrendous breeders. Prior to my 'research', which was really just following links from an initial google search about something to do with rescue dogs, I didn't really know anything about the supply of animals to pet shops either. In fact as I looked into it further I realised that I purchased my previous dog, a 'designer dog', from quite a notorious puppy farm- which actually explains a lot about his behaviour. I should have done more research at the time but it was 10 years ago, I wanted the particular breed mix and I had never heard of a puppy farm. If you are reading this then ignorance is no longer an excuse, purchasing dogs from a pet shop or online is giving money to these bad people that hurt lots and lots of animals. Love the pet you have, give them the best life you can and if you ever decide to get a pet make sure you do your research. Only buy a pet from a registered, REPUTABLE breeder- follow these tips from the RSPCA, or consider adopting a pet from a shelter or rescue organisation. Talk about Oscar's law, talk about puppy farms if it comes up in conversation, share this post, 'Like' Oscar's Law on Facebook and make sure that people know about this because if people stop buying dogs and cats from pet shops then there will be no more demand and the cruelty will stop.